Most perennial plants can be moved successfully from one place to another in the garden, and fall is one of the best times to do it. Herbs add great colors and textures that complement “traditional” fall plants. Some basic steps will ensure that your feature will weather the winter in good shape to enjoy again next season. For lawn overseeding or renovation, start in September. This gives you time to fill in areas with poor germination this season rather than in spring, when grass seeding is less successful. Keep reseeded areas moist (not wet) until seed germinates. This may mean watering seeded areas for a few minutes a couple of times a day. Plant spring bulbs any time from now through mid-January. October is also one of the best times to plant trees and shrubs. 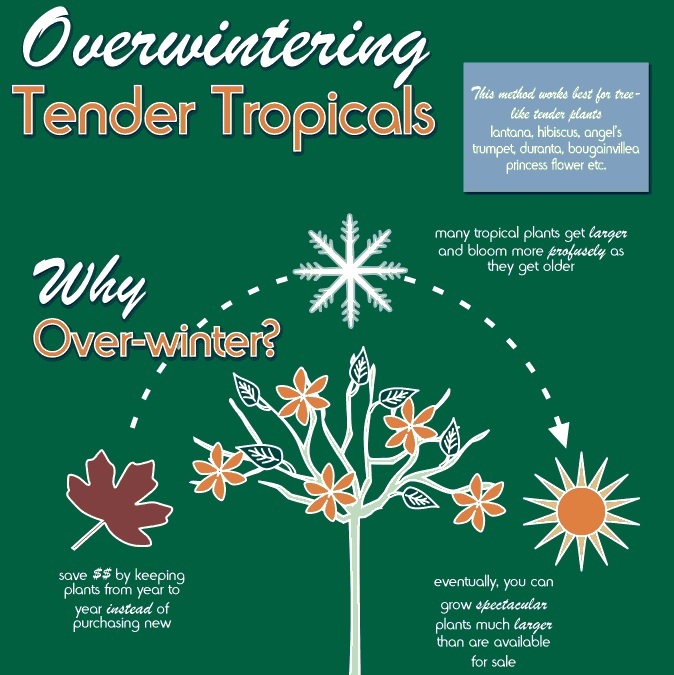 If you’re planning to overwinter any tender tropicals, bring them inside before frost. Bring in any houseplants that spent the summer outdoors before the temperatures drop below 50 degrees at night. Spray tropicals and houseplants with insecticidal soap or oil to kill any insects that may hitch a ride indoors. See more on overwintering below. Keep falling leaves off of newly seeded lawns. Blow or rake very gently. Rake up and dispose of garden debris to minimize carrying diseases over to next year. Lift tender flowering tubers and bulbs (Dahlias, Tuberous Begonias, Cannas, Calla lily, Gladiolus) to store after the first killing frost. Shut down your irrigation system, drain hoses and take in any hose fittings to avoid costly freeze damage. Avoid pruning after August 15, except for diseased or damaged areas. Want to keep your hibiscus, bougainvillea or other tropical plant over the winter? Follow these steps and you can enjoy a beautiful plant next summer. Click image below to view.